It’s that time of the year, when we all have good intentions to get in our best shape. We get into a detox mode, we start some new healthy eating habits and we adventure into new workout routines. Those new resolutions are never easy to keep up with but with a little help from my new find love, I might be able to get some nutritious breakfast on the go to get us started, detox for day and get the kids to enjoy some healthy “smoothies”. When my good friend introduce me to the idea of high nutrition through fresh fruits and vegetables using a NutriBullet, I needed to know more… Now I confess I am obsess with my NutriBullet. Every morning, I am creating drinks also known as Nutriblasts. Instead of juicing, where you loose most of the nutrients retains in the fibres, this technology uses 600 / 900 watt motor with cyclonic action and the patented extractor blades. This technology breaks down and pulverizes the stems, seeds, and skins where most of the essential nutrition lies – unlike what juicers and blenders do. Another big benefit of the Nutribullet over Juicers is that it’s a lot easier to use, prepare, clean and store. Its compact with no assembly require. Just fill the cup with ingredients, screw the milling blade cover on and push down into the base to get it working. Its so easy, convenient and affordable. I am no nutritionist or health advisor, you will find plenty of recipes and many tips online on how to use the Nutribullet to your best advantage. But here’s how I incorporate this “extraction machine” into our family routine. Breakfast on the go. Every day I create a “ powerful nutriblast” to kick start the day. Start your day with this nutrient-packed mega-Blast! You'll feel a powerful dose of antioxidants and energy to get through the day. A combination of baby spinach, apple, pineapple, banana, kiwi, coconut water, flax seeds and some lemon for freshness. Make sure to use enough liquid to avoid a pasty texture. Simple no brainer combine banana, mix berries and coconut water . Try to sneak some greens in there to optimize your kids nutrient intake. A small handful of vegetables along with the fruit, especially spinach or avocado because of its mild taste. They'll never know! - Use it for nutrition, so think green and berries. - For breakfast blend include some banana or avocado for a creamy texture and to remain satiated for a few hours. - Add “super food” to boost your health, play with different combinations that include chia, cacao nibs, flax seed, hemp, wheatgrass... Also think about healthy fat and proteins like nut butters or almond milk. - Add some pre-made boost like a "Smoothie Bomb", quick way to to increase overall vitamin, mineral, protein, iron and fibre intake. There’s the original 600 watts Nutribullet machine with a 24 oz cup. 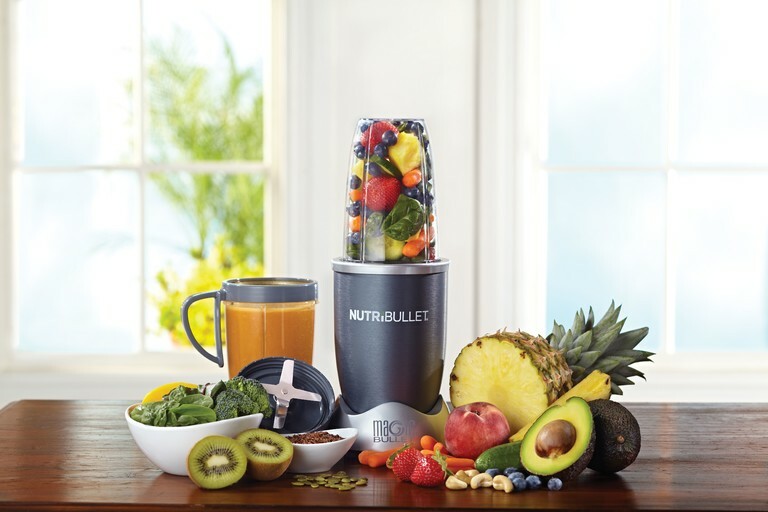 The Nutribullet PRO 900 watts with a 32 oz cup. The Nutribullet RX 1700 watts with a 45 oz cup. The main difference between these three versions are the power of the motors (watts). A higher wattage of motor will have more power. I am so happy with my 600 watts but would be interest in the Nutribullet RX 1700 watts for its heating capacity. The NutriBullet comes with a recipe book and some great suggestions but its also good fun to play with different ingredients and come up with your flavour combination. Have fun and get the kids involved. Blast your way to health. Available at mumzworld.com , carrefouruae.com and ACE. Retail price is about AED 390 for the 600 Watt motor.